Slomczynski, Kazimierz M. and Irina Tomescu-Dubrow. 2012. 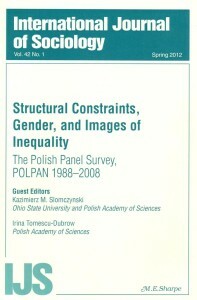 “Guest Editors’ Introduction: The Polish Panel Survey, POLPAN 1988–2008.” International Journal of Sociology 42(1):3-5. Kiersztyn, Anna. 2012. “Employment Instability: A Dynamic Perspective.” International Journal of Sociology 42(1):6-30. Domański, Henryk and Dariusz Przybysz. 2012. “Friendship Patterns and Social Inequality.” International Journal of Sociology 42(1):31-59. Kunovich, Sheri. 2012. “Voting Rates 1989 to 2007. Is There a Gender Gap?” International Journal of Sociology 42(1):60-77. Dubrow, Joshua Kjerulf. 2012. “Do Political Parties Represent Women, the Poor, and the Elderly?” International Journal of Sociology 42(1):78-86. Karpiński, Zbigniew. 2012. “Popular Assessments of Earnings in Various Occupations.” International Journal of Sociology 42(1):87-107.